I mentioned in my post yesterday that I was reading Emperor’s Blades by Brian Stavely. I started it this weekend, after much urging from the Mister (who is a big fan of the series), and am really enjoying it. I also have been reading through the Fables series for the last year or so, and while I’m not always in love with what they do, I think it’s a very interesting and entertaining series. I love fairy tales and am a real sucker for anything involving them! 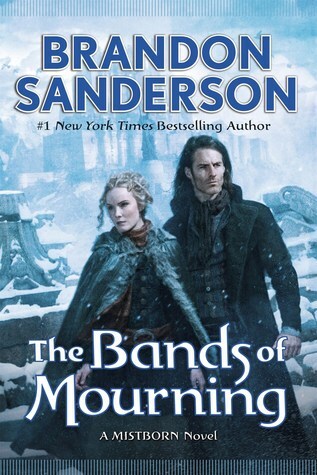 I just finished up Bands of Mourning ignoring it for way too long! 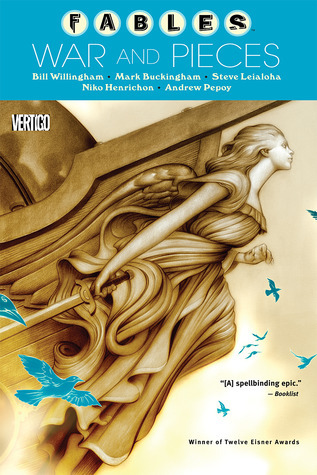 It was a good read and I liked it better than the previous Mistborn book (Shadows of Self). I’m a huge Sanderson fan so I’m always happy diving into the worlds he creates. I’m not the best at planning on what to read next. It’s usually just me staring at a shelf and picking something out at random, but I’ve been wanting to read these two pretty bad, so I think they’re a safe bet. 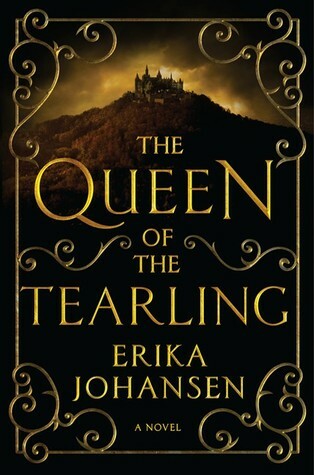 I’ve had The Queen of the Tearling on my shelf for a very long time and I’ve always thought it was such a pretty looking book! 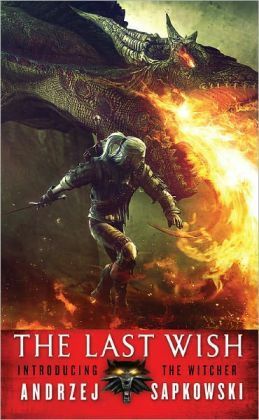 As far as the Last Wish, the Mister and I have been playing through the Witcher games (starting with the first one) and it’s a pretty in-depth world. I’ve heard good things about the novels, which came out first! I’ve decided to celebrate by reading more of the Emperor’s Blades by Brian Stavely! I started it this weekend and I’m enjoying it so far. I'm taking part in the #tbysreadathon this weekend! This is what I'm diving into tonight (probably along with some books that aren't so long)🦄 I've been meaning to read this for ages! Hope y’all are enjoying some reading time today! What are you diving into? Happy Friday! It’s a long weekend and on top of these two memes, I’m doing a readathon. I know I haven’t been here for a while (sorry 😅), but I do have some exciting plans to get this little blog up and running! Now, let’s get started. Also, I’m participating in two different blog memes today. They complement each other so well, why not? 3. Find any sentence (or a few, just don’t spoil it) that grabs you. 5. Add the URL to your post in the link on Freda’s most recent Friday 56 post. Share the first sentence (or so) of the book you are reading, along with your initial thoughts about the sentence, impressions of the book, or anything else the opener inspires. Please remember to include the title of the book and the author’s name. 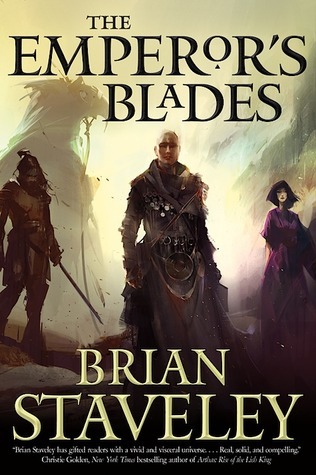 The book I selected is The Emperor’s Blades by Brian Staveley! I’ve had this book sitting on the shelf since it’s release and I’m always meaning to read it. The Mister has already read the whole series and has been hounding me to start this. I decided that this Readathon was a good opportunity to get this giant book off my TBR. Rot. It was the rot, Tan’is reflected as he stared down into his daughter’s eyes, that had taken his child. Valyn hesitated, suddenly conscious of the weight of her hand on top of his own, of the delicate, salty scent of her hair. She held his gaze with those wide, almond eyes of hers, her lips slightly parted. Those sentences are pretty different! The first is quite dark and the second is a little romantic, which is actually a pretty good combo for me :P. I’m excited to dive into this book! What are y’all reading this weekend? I really enjoyed the first part of this series; Crazy Rich Asians was a lovely little surprise for me last year. I usually don’t read too much contemporary and it’s beyond rare to find a book that will make me laugh (particularly in the out-loud-while-sitting in-a-coffee-shop-and-drawing-stares variety). All of this considered, I was very excited for this book! I had heard from friends that this sequel wasn’t as good as the first, so my expectations were somewhat tempered. While I agree it wasn’t as amazing, this book was tons of fun! China Rich Girlfriend picks up 2 years after the first book ended. Rachel and Nick are about to get married, Astrid is still married to the increasingly wealthy (and awful) Michael, and their numerous aunts and uncles are still finding things to get upset about, from serious to ludicrous. While Crazy Rich Asians was mostly about Rachel being introduced to her boyfriend’s ridiculously wealthy family and trying to gain their acceptance, this book introduces us to Rachel’s mystery father and his family comes with a whole host of problems. Surprise, surprise, they are also billionaires (what would be the fun if they weren’t? :P)! I totally recommend this to someone looking for a beach/vacation read or just in need of some entertainment. The characters are pretty much the same as the first book, don’t expect too much growth or enlightenment here, but I didn’t feel that was the point of the book. This is a sneak peek into this wealthy lifestyle and I’m not looking for major character growth. Don’t get me wrong, Rachel and Astrid, in particular, are lovely, but many of the side characters are flat. I did find the new characters from Rachel’s family, entertaining and there were some good stories there. I’ll refrain from saying too much in the review, but they are different from what we’ve seen before. I will add, I am really happy that there is a third book in this series. It ends in an unsatisfying way, it’s not a cliffhanger or anything horrible, but my thoughts about the book would’ve been more negative if I thought it was the conclusion to the story. Cover Critique: I love the covers to this series. I will shamelessly say that the covers are the reasons I wanted to read them in the first place! They are very graphic and simple, and I adore the bright colors. The paperback of China Rich Girlfriend has a different cover, which I also really like. I do think it makes a better pair with the paperback of Crazy Rich Asians than this one does, since they are both just faces rocking some awesome earrings. Quick Version: This is a perfect summer read. And by summer read I mean something that will make you laugh and enjoy some soap-opera-level drama. China Rich Girlfriend is a charming book that excels in pulling you into its lavish world. The characters, apart from the main few, are fairly two-dimensional, but from the way Kwan writes them they still feel like people. Money can bring out the peculiarity in people and this book captures this in an entertaining way. Sai Jinhua is only seven-years-old when her father is executed and leaves her all alone. As the daughter of her father’s adored concubine, she may have been his treasure, but his first wife does not see her in the same way. Left in ruins with a girl she despises, she sells young, sheltered Jinhua for seven silver coins. Jinhua is eventually sold to a brothel and her life takes an ugly turn. From having a father who refused to let anyone bind his little girl’s feet, she has her feet broken and destroyed. For their investment in her, she is expected to become a “money tree” at the brothel when she reaches the ripe old age of twelve. Her only joy at this time in her life is her friendship with the crippled maid (crippled by a foot-binding gone wrong) at the brothel, who becomes her sister. The Courtesan is a beautifully written novel inspired by the real-life courtesan Sai Jinhua. She lived during a tumultuous time in China’s history (end of the Qing dynasty, the Boxer rebellion, and invasion by European powers, for example) and tended to find herself in the middle of it. Eventually she is taken out of the brothel and an old, peculiar scholar makes her into his concubine. With him she travels the world. He is named the ambassador from China to the Austro-Hungarian Empire and while he dreads leaving the homeland, Jinhua flourishes abroad. She tries her hardest to learn about this new world while her husband will not allow her to leave the house or take guests. However, little by little Jinhua starts to find her freedom. Curry takes many liberties with the life of Jinhua, but there is not much concrete known about her life in the first place. She has become a figure of legend in China where people debate the veracity of almost every aspect of her life. I wasn’t bothered by this, though. Curry embraces this mysteriousness in the novel. She skips time periods in Jinhua’s life and at times (especially towards the end of novel) the novel feels like a series of elongated vignettes and poetic moments. This novel excels in my favorite part of historical fiction novels, which is crafting a character that feels real. Sometimes this genre gets so bogged down by accuracy that it neglects to make these legendary figures feel human and to give context for their world and actions. This novel is truly about the search for freedom. Jinhua was owned for most of her life. She was either paying off a huge debt to a brothel or being a concubine to a man who saw her as something she wasn’t. She pays some huge prices for this throughout the novel. Her strife is mirrored by her friend, Suyin, who does not have the luxury/curse of being beautiful and desired. While Jinhua is the lead character without question, Suyin does play an important role in the novel and without her I feel that it would’ve been a lesser book. Cover Critique: It’s so beautiful. I love the painting they chose for the cover. She looks so guarded and shy, while still being beautiful and intriguing. I also really like the title and author’s name on those two strokes of paint. The painting behind them is so realistically done and perfect, and those two slashes show a impulsive and emotional quality to the book. Quick Version: The Courtesan is a book about a near-mythic, mysterious, controversial figure of Sai Jinhua. She went from young “money tree” at a brothel to a woman who traveled the world and influenced key political figures in early 20th century China. Curry weaves her tale with a focus on poetic language and immersing the reader into Jinhua’s emotions and experiences. I sadly didn’t know anything at all about Jinhua before reading this book and I’m left with a desire to learn more, which is something that all good historical fiction does. Yael wants Hitler dead. She is willing to do anything to see this man pay for what he has done to the world and her people. When she was a little girl she was taken to a death camp and after a being subjected to horrible experiments, she managed to escape. It’s now 1956 and Germany and Japan have carved up the world between them. A rebel group sees their chance to execute the Führer by entering Yael into the annual motorcycle race that crosses Asia, from Europe to Japan, which if she wins, we get her close enough to end him. The Nazi experiments left Yael with the ability to change her appearance. She must imitate last year’s female victor (Adele) to try to win again, but she does not anticipate Adele’s twin brother and a jilted boyfriend to also be in the race testing her cover at every moment. I’m not usually into alternate histories. Alternate WWII stories, especially, tend to be everywhere and after a while they just seem to have more fun playing with ‘what-ifs’ than actually telling a good story and developing intriguing characters. Wolf by Wolf does an excellent job of not falling into that trap. It is original, clever, fast-paced, and the world is very well-developed. Yael is a well-crafted character. She is damaged and because of her abilities she has spent most of her teenage life pretending to be the enemy. She can’t even remember what she used to look like before the experiments erased her identity, but Yael still manages to have a strong sense of self. The one thing that she cannot erase when she changes skin are the numbers stamped into her skin. She decides to hide these with elaborate wolf tattoos to represent people she has lost and what she is fighting for. It helps her remember who she is and even though it would be so easy, she doesn’t just run away from it all and blend in with the population. While racing and interacting with other racers we see her world expand and her character grow more and more. Cover Critique: It looks like a WWII propaganda poster (what a surprise! 😛 ). I think it works perfectly for this book. I like it. 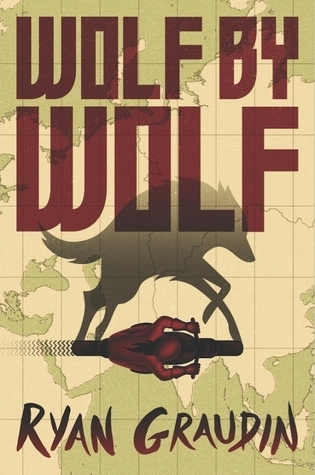 Quick Version: Really interesting and entertaining take on the Axis powers had winning WWII. The world is interesting and thought-provoking, the motorcycle race is entertaining, and the protagonist, Yael, made you want to keep reading and rooting for her. I didn’t know until I was at the end of the book that this was part of a series and while that lead to this ending being a bit anti-climatic, I still really enjoyed it and will definitely be reading the sequel. I had been reluctant to read this book for so long. My husband and brother have been recommending this to me nonstop for the past year, and even though it sounded perfect for me, I was reluctant to take the plunge. Sometimes when people recommend things to you so much, you are afraid that you won’t like it or that you’ll somehow be disappointed. I’m beyond glad to say that this was not the case with Ready Player One. This book lives up to all it’s much deserved hype and it not only met my expectations, it exceeded them! Wade Watts is a about to graduate from high school and his life isn’t going too great. It’s 2044 and the world is an ugly place. The only place that he, and most of the world, feel alive is inside the virtual world of OASIS. Everything for him happens inside his headset, including school and meeting friends. He hasn’t known much of a life outside of OASIS and has spent the majority of his childhood obsessed with finding clues to the secret the creator, James Halliday, left inside the game. In his will, Halliday promised that whoever solves the puzzles will inherit the company, which means control over OASIS and becoming a multi-billionaire. Halliday was an 80’s nut and completely obsessed with video games and geeky pop culture. The hunt for clues has stalled and everyone thinks that nothing will ever be found, but one day under-leveled Wade finds a clue. This turns everything on its head and the race ramps up. During the competition Wade finds out that there are big forces going after this prize and more than OASIS is at stake. I’m a big 80’s nut and complete geek, anyone who knows me in real life can definitely attest to this. 😛 I’m the child of two 80’s obsessed parents, so my childhood consisted of a steady diet of John Hughes, action/scifi films, and 80’s songs. And while these references are entertaining and it’s amusing when you know exactly what obscure movie moment they’re referring to, it’s not what’s best about this book. 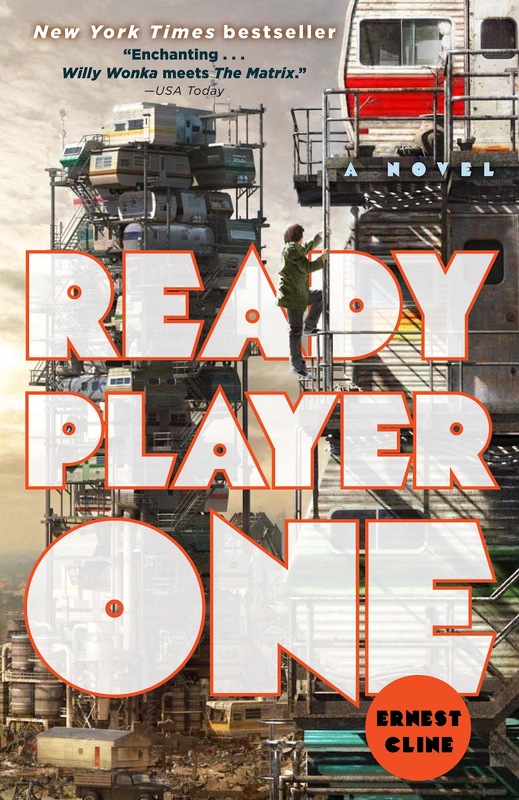 Ready Player One manages to balance heart and brain better than most other scifi/dystopian titles. It’s very clever, but it doesn’t revel in its own intelligence. There are many different references that I didn’t understand at all (like specifics about old arcade games), but it didn’t lessen my enjoyment of those moments. Wade beating a game of Pac-Man is actually amusing to read about, which if you’ve ever watched anyone play it that’s pretty impressive. Even if we’ve never cared about beating Pac-Man that much, we can all relate to trying prove yourself better than the rest, whether it’s in a game or in real life. The stakes always felt very high in this book. Many times with these types of stories you never really feel anxious for these players. Like, if they don’t make it, they’ll still be fine in the end. Cline does an excellent job of ramping up the consequences for the characters’ actions as the story goes on. It’s not a story about saving the world from Sauron or anyone who’s going to blow the planet to smithereens, but while you’re reading you do feel like if the protagonists don’t come out on top, many bad things would happen to them and to society. Cover Critique: I really like this cover for the book and the original one. They both share the title in a huge font, spanning basically the entire cover. It makes for a striking and memorable image. The original is a little more graphic, since it is just yellow words on a red background. But that combination of colors has never been my favorite and makes the book look a little more dated, which considering the 80’s fest, is probably intentional. The cover I used on the post is the one I have, and I really like the illustration. It’s really well done and easily shows you just how bad the world outside this game is. 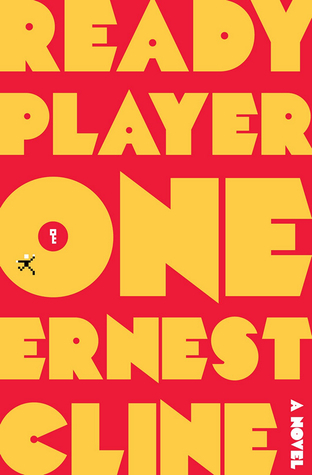 Quick Version: Ready Player One is an extremely entertaining book that you can easily read in a couple of days. It’s quick-paced and funny, and also makes you care so much for its cast of unique characters. While it does help to be a fan of 80’s pop culture and/or video games to get into it, the book does a good job of explaining these topics enough that you don’t have to be an expert to enjoy the novel. Happy Friday everyone! I bet you are all as happy as I am that Friday is finally here. To start off this day, I’m participating in two different blog memes. They complement each other so well, it just had to happen! 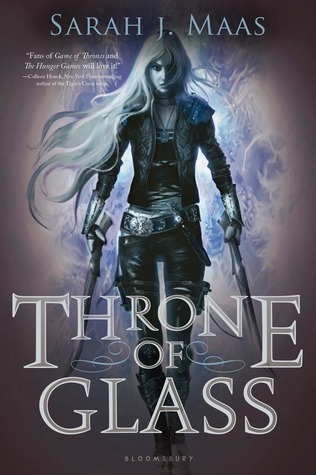 The book I selected for this Friday is Throne of Glass by Sarah J. Maas. I’ve been wanting to read this book for ages (I feel like I’m the only one who hasn’t 😛 ). So, I’m starting it today! Instead of reading, she could perhaps use the pianoforte, but… well, it had been a while, and she wasn’t sure she could endure the sounds of her own clumsy playing. She traced a finger over a splotch of fuchsia silk on her dress. All those books, with no one to read them. These sentences definitely want to make me read the book right away—mission accomplished! 😀 What do you guys think? 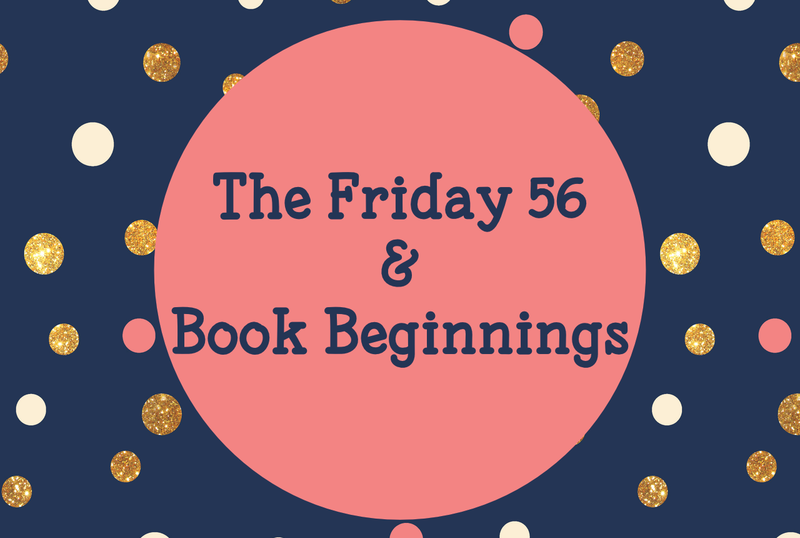 Do you have a 56 or book beginning? More time to read in the day! It’s hard to find time to read sometimes, life gets in the way. Maybe a place where time will pause and I can just read there for a while. To be able to do other things while I read! Kinda goes with the first wish. Audiobooks let me drive/cook/fold clothes while “reading,” but sometimes I wish I could read physical/digital books instead. All the pretty covers! I wish all books had beautiful covers. I don’t want them all to be lovely in the same way, that would be so boring, but I do really hate it when books I love have awful covers. Ability to underline and markup my books while keeping them nice! I love a pristine hardcover, but I also love a book that looks loved and is full of my thoughts and underlined passages. I’m on both sides of the spectrum and it’s tough sometimes. Anime version of Western books! This is a really nerdy request, no shame! I am usually very disappointed with movie adaptations of books, especially scifi and fantasy. I think than an anime or any type of animation would be so much better! Don’t have to worry about the magic and stuff looking dumb with bad CG and the characters and different races won’t just be made into humans. Mistborn is one I REALLY think would make a great animated series. Able to buy all the books! I wish I could get all the books I want and actually have space to put them all. Books I’ve been waiting for to FINALLY come out! This goes out to GRRM and Tamora Pierce, especially. I don’t need to explain Martin, I don’t know if we’re ever getting the ASOIAF books. Pierce has been promising more Tortall books forever and they still haven’t come out. I just want that Numair book, is that too much to ask!? Taking the stories from my imagination to the page! This wish isn’t too fantastical, but it’s something I would really love to happen. I have always been nervous/afraid about writing and putting myself out there. I need to gather up my courage and give it a real shot! Hopefully all of the things on this list happen 😉, but this is the one I really want to come true (with a TON of effort from me, of course). 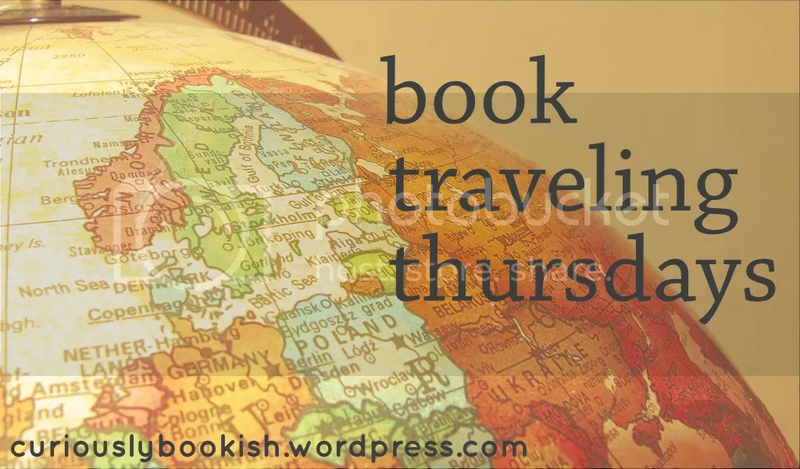 This is Book Traveling Thursdays! A weekly meme created by Cátia [The Girl Who Read Too Much] and Danielle [Danielle’s Book Blog]. The goal is to share the covers from around the world of a book related to that week’s theme. You share the original cover, cover from your country, your favorite, and least favorite covers. You can find out more on the Goodreads group. This week’s theme is for a book that had a major plot twist. I do tend to fawn over books with crazy plot twists, so at first I had a tough time thinking of one book in particular. 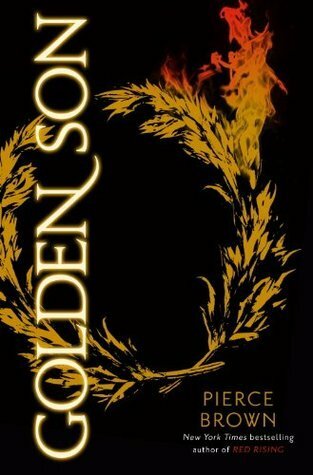 Until, I was looking at my shelf and saw Pierce Brown’s Golden Son peeking out at me. This book had an insane number of twists and turns, every time I thought I had figured out where it was going, Brown changed it up on me again. How could I pick anything else? So simple and graphic. 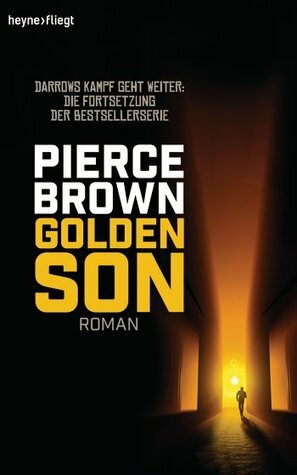 The laurel wreath lighting on fire is the perfect representation of Golden Son. I also love the way that the title is written vertically across the cover and the wreath is tilted towards it, drawing your towards the words. It’s just very cleverly designed. This cover is just so bad. I’m sad for Germany that they have to look at this. It takes a modern, scifi novel and makes it look like some outdated book published in the 80’s about the history of space or something.